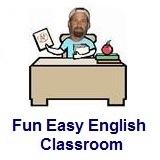 ﻿ Fun Easy English - new classroom free online classes english language lessons speaking listening writing reading november 21. Today in the Fun Easy English classroom you are going to learn "woulda" an American English reduction. I woulda thought this would be a little cheaper. She woulda looked a lot better with a different hair color. He woulda made it to work on time if he did not stay out late last night. I woulda asked her out on a date if I knew her phone number. They woulda liked this restaurant more if the food was less spicy. Woulda is generally used to indicate an action which could not be completed due to some other reason. Note the following video also contains the American English reductions shoulda, coulda, gonna, and gotta. 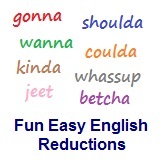 Reductions, such as woulda are not real words in English. Video: Beverley Knight "Shoulda Woulda Coulda"
Beverley Knight "Shoulda Woulda Coulda" - Beverley Knight MBE (born 22 March 1973) is an English singer, songwriter, and record producer who released her debut album in 1995. This is her song "Shoulda Woulda Coulda" with lyrics written in English. Use a dictionary to look up words you do not understand. Lyrics: Beverley Knight "Shoulda Woulda Coulda"
Too late to realize how far apart we'd grown. But sometimes when I'm not so strong I..